Comprehensive's MicroFlex Pro AV/IT HDMI cables were designed specifically for the tight spaces encountered by systems integrators, I.T. and B2B professionals with features not found anywhere else. Microflex Pro AV/IT HDMI cables feature a low profile design and un-heard of flexibility that make them perfect for use in surface access boxes, equipment racks and other tight spaces including behind flat panels where space is limited. Comprehensive's exclusive ProGrip connector utilizes up to 16lbs of retention force to ensure a tight connection at all times and help prevent cables from being unintentionally disconnected. SureLength indicators clearly indicate the length of the cable right on the connector head for quick and easy length identification in the field. 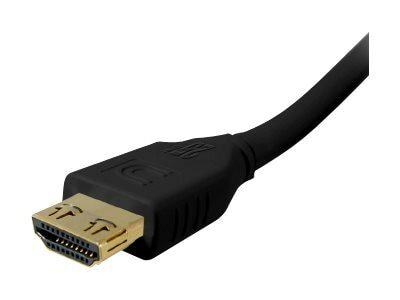 Microflex HDMI cables are also available in multiple professional colors for easy cable identification. These features are huge time savers for installers who are constantly sorting out lengths preparing for jobs and rack building. All of these features are included in a cable with a connector head and O.D. that is up to 40% smaller than traditional HDMI cables while providing state of the art capability including HDMI 2.0, Ethernet, Deep Color, Dolby True HD and DTS-HD Master audio, audio return channel, and support for 4K x 2K resolution. Triple professional grade shielding including 85% tinned copper braiding provide superior rejection of EM and RF interference. Comprehensive's extra flexible jacket makes this cable perfect for any commercial or residential installation. A molded strain relief and ultra-flexible jacket provide unsurpassed durability. As always, Comprehensive's famous Lifetime Warranty come standard.